Disneyland Resort is the first Disney park that opened. It was Walt Disney’s dream come true. One thing Walt Disney agreed with was change, he always wanted to make the parks better for guests. This includes refurbishing existing attractions, taking out the old to make way for new and constantly striving for better experiences. If you have not been to Disneyland Resort in a couple years, here are 15 must know changes. Mobile Ordering allows guests to pre-order and pre-pay for their food, saving time waiting in line. Mobile Ordering recently expanded through the Disneyland App and now accommodates more than 20 participating locations. Newest additions include Edelweiss Snacks, Refreshment Corner, Royal Street Veranda and Stage Door Café. Order anywhere on Disneyland Resort, even while in line for an attraction! This is a fantastic addition to guests experience at Disneyland Resort. Main St USA at Disneyland went under refurbishment early 2018, it resulted in the brickwork being replaced. This was also the first time in history Disney had replaced the streetcar track. The original pieces of the track are said to be preserved elsewhere. It’s Tough To Be A Bug closed on March 19, 2018 at Disneyland Resort. Al though, guests of Disney World can still see this classic. Disneyland Resort has announced a new Super Hero-themed land planned for guests in 2020 featuring The Guardians of the Galaxy, Spider-Man and the Avengers. A Bug’s Land opened in 2002 at California Adventure Park. However, after a long run this land is now closed. A Bug’s Land was also closed to make way for the new Super-Hero themed land in 2020. Guests of Disney California Adventure park can meet & greet with the Disney Junior star, Vampirina. Find your Vampire Pal in Hollywood Land. Also, opening on 2/1/19 is the Disney Junior Dance Party, which Vampirina will also be in. World of Disney is the largest retail shop on site at Disney World (Disney Springs) and Disneyland Resort (Downtown Disney). The year 2018 brought a lengthy refurbishment to the store throughout the year, closing in sections until its completion. Guests will now find a more open, modern and more enjoyable shopping experience at World of Disney, with magical enhancements. Pirates of the Caribbean reopened At Disneyland Park in Summer 2018, after its refurbishment to update the auction scene. The Wench scene was removed from auction. Now, the woman with Red hair is a pirate named, Redd. The auction scene now is an auction of goods, with Redd in a talking role. All runDisney race weekends and marathons at Disneyland Resort were cancelled starting 2018. The last even Disneyland hosted was the Super Heroes Half Marathon Weekend at Disneyland Resort November 9-12 (2017). There is no announcement on when Marathons will return to Disneyland Resort. Reasons stated, the level of construction for Disneyland Resort expansion will inhibit positive guests experiences. Disney will continue to offer races at: Walt Disney World Resort, Disneyland Paris and virtual race series. In June, 2017 the classic Space Mountain returned to Disneyland. Prior to this (Since 2015) the ride has been the Hyperspace Mountain, an outer space Star Wars adventure. Disneyland started testing out a single rider queue for their Space Mountain attraction at the end of 2017. It has so far stuck around, this makes 4 attractions with the single rider line option at Disneyland Park. For those traveling as a group, you may still use single rider line just know you are not guaranteed to ride together (otherwise use regular queue). Disneyland Resort rolled out Disney MaxPass, as an option starting Summer, 2017. Benefits include unlimited amount of digital downloads for daily Disney PhotoPass and the ease of booking Disney FASTPASS selections through the Disneyland App. Cost is $10 per day. Disneyland Resort Annual Passholders have the option to buy MaxPass at a flat rate of $75, good for the life of their passport. Signature Plus passholders will receive Disney MaxPass will receive this benefit at no cost. Guests may still obtain free FASTPASS at the kiosks for Disneyland Resort. Guardians of the Galaxy – Mission: BREAKOUT! opened May, 2017 for guests at the former Tower of Terror location in Disney California Adventure park. Step into the story of Guardians of the Galaxy like never before. There are offers for free parking, however they involve needing to spend money at Downtown Disney. The changes started on August 16, 2017. Visitors can earn 2 hours of free parking with a $20 minimum Downtown Disney purchase and parking validation (example, quick-service restaurants or Kiosks). Visitors can earn 4 hours of free parking with an AMC theatre experience or Downtown Disney table-service restaurant plus parking validations from either option. Otherwise, fees look like this: Going over 2 or 4 hour limit will cost $12 additional per hour. However, the charges at each 1/2 hour for $6 each, visitors will have a 15-grace period before fees start. The attraction Soarin’ was renamed to Soarin’ Around The World on both coasts (Disneyland Resort & Disney World) in June, 2016. Soarin’ Around the World brought new video and scenes from around the world. Holidays at Disneyland Resort occur early November through early January each year. Maximize Holidays at Disneyland Resort with these 15 tips, including must do attractions and more. There are 3 on property hotels to choose from: Disney’s Grand Floridian Resort & Spa, Disneyland Hotel or Disney’s Paradise Pier Hotel. Each Disneyland Hotel will be decorated for the season with over the top decorations, including the famous Gingerbread house at Disney’s Grand Californian Resort. Downtown Disney District gets in on the holiday fun too. The area will be decorated throughout, 2018 brought 6,200 ornaments in addition to other décor. Stop for fun photo opportunities. Seasonal food and drinks will be available at various eateries. Plus, holiday entertainment and holiday shopping are 2 more great reasons to visit. Yearly from early November through early January is the Disney Festival of Holidays at Disney California Adventure Park. Guests can enjoy festive food booths, added entertainment and more included with park admission. Be sure to catch A Christmas Fantasy Parade in Disneyland Park. Watch Anna, Elsa, Olaf and more favorite Disney characters come down Main St USA. Featuring 5 floats, the last one holding Santa Claus himself. Shown twice daily during the holiday season. Each year it’s a small world turns into it’s a small world Holiday. Be sure to catch this special version during the holidays featuring thousands of added lights and traditional holiday music. Benefits of MaxPass include unlimited digital downloads for daily Disney PhotoPass and the ease of booking more than 15 options for Disney FASTPASS selections through the Disneyland App. This includes attractions such as Toy Story Mania, Matterhorn Bobsleds and more. Cost is $10 per day per ticket. Disneyland Resort Annual Passholders have the option to buy MaxPass at a flat rate of $75, good for the life of their passport. Signature Plus passholders will receive Disney MaxPass benefit at no cost. Guests may still obtain free FASTPASS at the kiosks for Disneyland Resort. However, MaxPass will save guests from running to a FASTPASS kiosk. Past guests say it is worth it. Mobile Ordering allows guests to pre-order and pre-pay for their food, saving time waiting in line. Mobile Ordering recently expanded through the Disneyland App and now accommodates more than 20 participating locations. Order anywhere on Disneyland Resort, even while in line for an attraction! For the holiday season, this includes being able to pre-order select holiday treats! Download the Disneyland App for a guide to all things at Disneyland Resort. Guests can check start times for A Christmas Fantasy Parade and more entertainment such as character appearances. Plus, now make or modify dining reservations on the app. Visit Haunted Mansion in New Orleans Square at Disneyland Park for a holiday layover. Each winter, the Haunted Mansion transforms into Haunted Mansion Holiday. Cars Land gets its own holiday décor. Find Christmas trees, décor inspired by car parts and more. Plus each attraction plays holiday music. Look for favorite snacks with holiday twists such as the Churro. 2018 brought the Gingersnap Churro with cream cheese dipping sauce to Cozy Cone Motel, plus many more at various locations throughout both parks. Popcorn is another favorite snack, and the holiday popcorn buckets are a fun souvenir. Also look for beignets, gingerbread men, eggnog, holiday cocktails and more. Mickey’s Toontown is found in Disneyland park. Visit during the holiday season for fun décor and holiday trees. See the Disneyland Christmas tree on Main St USA. It is the perfect backdrop for holiday photo opportunities. The tree stands at an impressive 60 feet tall. End your evening at Disneyland Park with the, “Believe…In Holiday Magic” Fireworks Spectacular. See a holiday fireworks spectacular bringing shimmering snow-caps and sparkling icicles to Sleeping Beauty’s castle. Plus it snows! Guests will find snowfall over parts of Main St USA, near it’s a small world Holiday and near Rivers of America. Want a behind the scenes look? Consider the “Holiday Time at the Disneyland Resort” Guided Tour at $85/per person. This is a 2.5 hour walking tour at behind the scenes look at the seasonal transformation. Plus, reserved seating for A Christmas Fantasy Parade, holiday treats, Collectible Pin & personalized button and more are also included. Offered through the holiday season. Separate Disneyland Park admission required. From snacks to signature dining, Disneyland has a range of food to enjoy. You will find a bit of everything on this list, all proven delicious. Below are 25 recommended foods to try at Disneyland. Some past guests even say food is better at Disneyland Resort than Disney World! Enjoying a rainy day at Disneyland is possible. Guests can plan every minute of their vacation, however weather can be unpredictable. Therefore, be prepared with these 12 tips for a rainy day at Disneyland. Ponchos – pack ponchos and save big from buying them at the park. Consider a trip to Dollar Tree before your vacation. Animation Academy (Disney California Adventure Park) – guests can stay dry and learn how to draw a Disney character, with step-by-step instructions. Occurring every half hour. The Bakery Tour (Disney California Adventure Park) – guests are invited to take a tour that includes free bread samples. The Disney Gallery (Disneyland Park) – if you find yourself in the rain on Main st USA duck into The Disney Gallery. Then browse the Disney art on display. Main Street Cinema (Disneyland Park) – another perfect rainy day activity is visiting the Main Street Cinema. Guests can view classic Disney animated films. Minnie’s House (Disneyland Park) – visit Minnie’s House and see her living room, kitchen and bedroom. Sleeping Beauty Castle Walkthrough – Take time to relive the story of Princess Aurora and Maleficent told on the Castle walls. Sorcerer’s Workshop (Disney California Adventure Park) – Step inside the Sorcerer’s Workshop for exhibits on how animation is brought to life. Star Wars: Path of the Jedi (Disneyland Park) – step inside to relive moments from Star Wars films. Bowling – Visit Splitsville Luxury Lanes at Downtown Disney and get out of the rain with a game of bowling. Meet Mickey– Visit Mickey’s house and then meet the mouse himself at Mickey’s House and Meet Mickey. Ride Again – when it rains, instead of walking around either park, stay out of the rain and ride your favorite attractions again. Headed to Disney World? Learn the best attractions to visit in the rain at Disney World, listed by park. If you are from the Northeast like me Disneyland is not usually the first place you think of when planning a Disney trip. Let’s face it Disney World is closer and when you have young children you are thinking get me there quick. Getting to your destination quick may not always be the best option. Disneyland is great for young kids. I’ll let you in on a little secret, it might even be better for young children then Disney World. Disneyland is much smaller than Disney World. Making Disneyland easier and quicker to navigate. You can get through Disneyland in a long weekend. This leaves room to go explore other parts of California. If you stay onsite at Disneyland it is a quick walk back to your hotel for a break if needed. The two parks are at Disneyland are located within walking distance of each other and in general there is a lot less walking for little feet and of course big feet also. Reservations for meals are easier to make in Disneyland. It is very common to be able to get a last minute reservation to a Princess meal or even a character breakfast. Not as many characters are walking around Disneyland so if you have a child who would run and hide if they see a character strolling around Disneyland is a much safer option for that child. I am by no means saying that you shouldn’t go to Disney World. My family goes there every year. If you are undecided though and debating on Disneyland versus Disney World I say go for Disneyland. If you have already been to Disney World you can compare the two and find out for yourself which you like better and which one your kids like better. Then let me know how you enjoyed your trip! Written by Lori Wall: Lori is a lifelong fan and visitor of Walt Disney World! Her love of Disney World has grown through visits with her own family as well as through planning magical vacations for others! Lori is an expert in maximizing vacations while sticking to a travel budget. Contact her about saving an extra 5% off your Disney vacation with an insider tip! Book your vacation with Lori at (845) 698- 0102 or request a price online. The Merida Meet and Greet at Disneyland can be found in front of It’s a Small World at Disneyland. Along with Merida, you will be able to meet the 3 bear cubs from Brave as well. They interact with Merida and play hide and go seek with her and those that come to meet them. There are also lots of activities inspired by the film. The first thing you can do after meeting Merida is learn to Shoot Arrows at the archery center. This is a place with a large center and blunt arrows. The arrows are specially made to stay on the wire very easily and the cast members are very helpful to help each kid do their best. The next place you can go is to find your clan. They have a wheel with the clan symbols on it. The worker tells you what you need to do to get the sword spinning. then where it lands tells you the clan you belong too. You then take your clan name over to the rubbing station and make a rubbing of your clan leader to take home with you. Then you head over to the training station where you learn to toss cakes like a real scotsman. I tried my best to match the food related items to the type you could find in the parks. 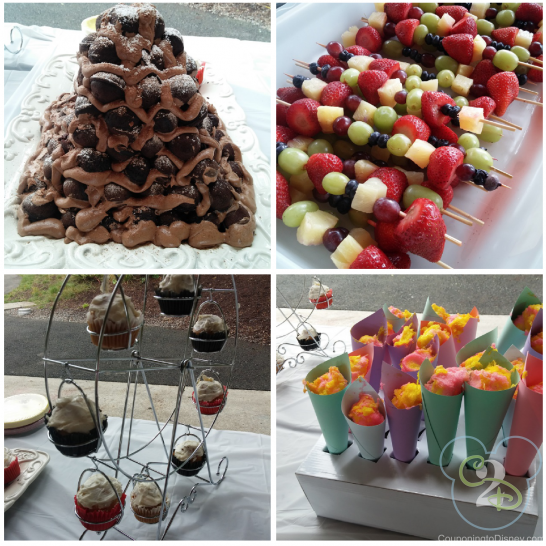 We had pretzels in cheese, fresh made popcorn, churros in chocolate syrup, fruit kabobs & veggie sticks in ranch dressing cups, cotton candy cones. For our cakes we had cupcakes that were featured in Mickey’s Fun Wheel-inspired ferris wheel cupcake holders. We used a cakepop maker to make cake balls and we built a rendition of Matterhorn Mountain (complete with powdered sugar snow on top). I made the giant Disneyland sign and ordered the character stand ups from Oriental Trading. I found some really awesome vintage inspired signs online that I printed & hung on string for a banner. I also found true to the park Mickey balloons on eBay. The park I chose to hold it at had a splash pad which served as our Splash Mountain. The Golden Zephyr in California Adventure glides you through the air in a sleek galactic gondola. We recently shared with you that Disneyland leaped into the tech world and began offering to do your dining via a Online Reservation System. Today we want to go over how this system works, so that you are prepared to use it and/or work with your travel agent on making your dining reservation choices. This system is very similar to Disney World’s system, even requiring Credit Card information to hold a reservation. Although you won’t be charged unless you fail to cancel or show up for your reservation. While it’s true that I often say that Disneyland and Disney World appear to be run by two completely different companies, it’s nice to see a couple parts of the planning process becoming similar. We do have a long way to go of course, but this is a good start. We all have to eat at some point right? The dining reservation timeline hasn’t changed a lot. You still can make your reservations 60 days prior to arrival, unlike Disney World which is 180 day prior. One item most Disneyland visitors will notice that’s different is the requirement of a credit card to hold your reservation. This is the second direct from Disney World item. Unfortunately, a few people would reserve multiple days/times for their families at the same restaurant(s) which would make it challenging for others to get reservations. Thus Disney will now charge you $10 per person if you don’t arrive to your reservation or cancel it within 24 hours. Using the system is really quite easy, and cuts out the need to email your requests or call Disneyland to make your reservations. This is truly the best part of the whole system. To make your reservations head to Disneyland Dining Reservations. You can also check other visitors reviews to see if any of the restaurants you are interested in. When Daniel isn’t sharing Planning Tips about Aulani, Disneyland and more, he can be found planning Disney Vacations. Contact him or Request a Quote on the right side of the CouponingtoDisney Page. 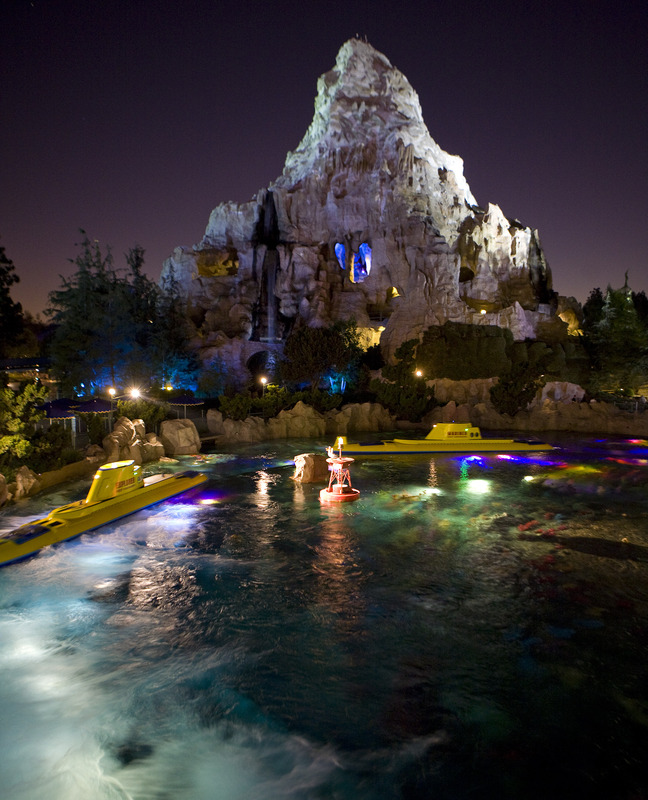 Are you excited to visit Cars Land or ride the Matterhorn Bobsleds? Have you always wanted to visit the Disneyland Resort but weren’t sure how to plan your vacation? Our friends at Destinations in Florida Travel will be offering a Disneyland Basics 101 Class online at 7pm EST on December 2, 9, and 16! This class is EXCLUSIVE for Couponing To Disney fans! Learn all about the Disneyland Resort and how to plan an affordable vacation to the only Disney Resort that Walt himself visited. To sign up, please click here< We will be accepting the first 30 people that sign up. If we have more than 30 people, additional classes will be offered in 2014. If you signed up, we will go down the list based on sign ups for these future classes. I enjoy Disneyland Christmas Decorations so much, I honestly could just keep posting and posting and posting. However, wouldn’t it be better to visit and see them in person??? If you don’t already know, you can easily contact me to plan your next Disneyland (or Disney World, Disney Cruise, Disney Aulani or more) Vacation. Or just hit that quote form on the right hand side of the page. Finally you can make your online Dining Reservations at Disneyland! We are so proud that Disney was able to find the time to take care of the original Park and upgrade their systems to allow all of us to easily make our dining reservations. Unfortunately, the timing isn’t new, it’s still 60 days prior. Before I became an International Man Of Travel, I would plan my own trips to both Disneyland and Walt Disney World (well I still do and now yours too). It was the most frustrating experience to plan trips. My family visits Disneyland at least once a year and Walt Disney World at least once every other year. Now with the new Online Dining Reservations, we are all one step closer to making all our lives easier. Beginning October 3rd we can all start living in the modern era when planning our Disneyland Dining Reservations. Nothing is just straight forward though, so let me cut to the ins and outs of the new program. Check back often with Couponing To Disney for the best information on Disneyland, Disneyland Online Dining Reservations and so much more. Who here, besides me has visited Disneyland Resort area in the last few years? What’s the one thing we all notice? The amount of empty lots, empty buildings and more just cluttering the perimeter of Disneyland Resort area. It’s really quite ugly isn’t it? So I’m excited to share that the Disneyland Area Hotels are increasing. Finally, some of these lots will be developed and Disneyland Area Hotels will get an additional 14 new hotels with a total of 3,770 new rooms to the area around Disneyland Resort. increasing the amount of new hotel rooms 19%. The hotel room occupancy rate is up 10% in Anaheim. With so many older hotels, it will be nice to see new hotels coming near Disneyland Resort, as well as some refurbishment of other locations. Katella Ave and Harbour Blvd which are the main streets by Disneyland, have already been razed and plans are already started on 2 new hotels with drugstores. Additionally a Marriott Sprinhill Suites will be opening on Ball Road. We will see the newest hotel opening as early as December of this year, with many more to follow. With so much construction and additions, it may be a bit crazy to get around the perimeter of the Disneyland Resort, but when construction is completed there will be many new hotels. Not only new hotels are breaking ground this year, there’s plans for a new waterpark just down the street from Disneyland Resort in Garden Grove. I can say that I have always been surprised with the lack of water parks open to the public near Disneyland. The only ones available are a distance away. Hopefully the water park will also be on the Anaheim Resort Transit line. In research for this article, I learned that the lot where Boogie Nightclub and Flakey Jakes are, which have sat empty since 2006, was leased by Disney in 2009. Perhaps plans to add a 4th Disneyland Resort Hotel. No word yet, and no plans have been submitted to the city for building permits. But It would be nice to have another moderate or value Disneyland Resort Hotel. Now you know that with all these new hotels coming, that it’s time to start planning your next trip to Disneyland, perhaps even planning a stay in the new hotel of your choice. I know just who to help you with this! Mickey Mouse has been busy with his Chef’s creating great new healthy food choices for our kids. The new Mickey Check Meals are a kid’s best friend when it comes to wanting delicious and nutritious food . While your child can still have the same chicken nuggets, burgers, hot dogs and the like. They can also mix in some healthier options throughout the visit at both Quick-Service locations and Table-Service locations within the Disneyland Resort. The Mickey Check Meals now makes it easier than ever to help your kids find colorful, delicious and healthier food options. To become a Mickey Check Item (and earning the above icon), the foods must meet Disney Nutrition Guidelines for sugar, saturated fat, sodium and of course calories. The Disney Chefs have had a lot of fun with the challenge of introducing their young guests to some great new tastes. And for the kids it’s just awesome! I’m telling you after reading through some of these items, I’m hungry. I also want to be a kid again. Risotto with Sweet Peas? Beef Tenderloin? Wow Disney Chefs have hit it out of the park with the offerings. I know my son will enjoy most of these items and I look forward to seeing some more color on his plate the next time we visit Disneyland. If you’ve had a chance to experience any of the Mickey Check Meals, please let us know what and where you experienced it, as well as your review of the food. We all want to know how it tastes! When Daniel isn’t sharing Planning Tips about Disneyland and more, he can be found planning Disney Vacations. Contact him or Request a Quote on the right side of the CouponingtoDisney Page. If you live near a participating Safeway, Vons or Pavilions location, you can save $10 when you purchase any 2-Day or longer Disneyland® Resort ticket or Annual Passport at a participating Safeway, Vons or Pavilions location. Valid for Disneyland Resort 2-Day, 3-Day tickets or Annual Passports. Not valid at Disneyland box office. Limit 6 tickets per purchase. Coupon expires 9/10/13. Check the ticket at the store to see if it has an expiration date (they usually do not). To print your store coupon, go here and enter the zip 92591. Are you ready to save up to 20%* off the Disneyland resort hotels on most stays Sunday through Thursday nights from Aug. 25-Sept. 28, 2013. From the stately elegance of Disney’s Grand Californian Hotel® & Spa, to the renovated Disneyland® Hotel and contemporary updates at Disney’s Paradise Pier® Hotel, the Hotels of the Disneyland Resort are so much more than a place to stay. This is the time to travel with discount prices and fewer crowds! Booking window: July 30-Sept. 5, 2013. Travel window: Aug. 25-Sept. 28, 2013. Travel must be completed by Sept. 29, 2013 (one-night minimum stay). Upgrade to a 2-night or longer package – including Theme Park tickets – and enjoy a variety of magical extras that will make their stay more memorable than ever! *Savings based on the non-discounted price for the same room at the same hotel on most Sunday through Thursday nights between Aug. 25, 2013 and Sept. 28, 2013 when booked from now through Sept. 5, 2013. Travel must be completed by Sept. 29, 2013. Offer is not valid on suites or with previously booked rooms. Excludes applicable taxes and fees. Advance reservations required. Check for offers on different lengths of stay. Subject to availability as the number of rooms allocated for this offer is limited. Limit two (2) rooms per reservation and five (5) people maximum per room. Not valid in combination with any other hotel discounts or offers. Subject to restrictions and change without notice. Separate Theme Park admission required to enjoy the parks. Are you ready to save up to 20% off Disneyland prices? Contact the Destinations in Florida team to book your Disneyland, California trip. Their agents specialize in all Disney Destinations, including Disneyland. Call them at 877-318-0323 or request a price online. Be sure you mention Couponing to Disney for a free phone call from Mickey Mouse! From Time to Time, Disneyland Resort has had the ever-popular Ink and Paint Cel Program come by for a visit from Walt Disney World. Disneyland has recently announced that the new Disneyana store on Main Street, USA will offer these as part of their regular offerings. In the beginning the Ink and Paint department was one of the largest in Disney Studios and was staffed by woman artists. Rumor is that there is at least one book coming out that will highlight the incredible painstaking work of the Ink and Paint Department. Of course with the introduction of photocopying technology and then Computer graphics technology the need for hand inked and painted cells is no longer necessary. However, many popular Disney artists still produce Ink and Paint Cel’s and these are sold at Walt Disney World Resort and now at Disneyland Resort. During the release of this special Ink and Paint Cel will be many of the artists associated with its creation will be on hand for the release, as well as be available to sign your new piece. These artists include: Eric Scales, Dave Smith, Charles Landholm, Todd Weisenhutter and June Valentine Ruppe. What if by chance you won’t be there on the 20th of July? Disney is offering this great piece today online. Click Here for more information on the online sale. Next time you’re in Disneyland, make a stop at Disneyana on Main Street, USA. Now located in the former Disney Gallery space, that once also housed the Bank of Main Street. Disneyland Limited Time Magic for the week of July 15th focuses on the Dapper Dan’s who travel back in time to bring you the Original Boy Band songs. They will be mixing together their old school song book with some of today’s popular boy band hits. Follow along with them as they serenade you with some truly classic barber shop quartet music. Have you had a chance to stop and listen to them? There harmony is amazing and is certainly a highlight to spend some time hanging out and just enjoying the sun on your face and a beautiful song or two. Isn’t that really what we go to Disneyland for? We love the rides and the shops, but what makes Disneyland so special to most of us is the pieces of the park we can’t get anywhere else. Here’s some trivia for you. Did you know that the Barber Shop Quartet known as Dapper Dan’s have been performing in Disneyland since 1959! They are as much a part of Disneyland as the Matterhorn, Splash Mountain and Main Street, U.S.A. If you are seeking them out and haven’t found them while roaming around the park, I suggest heading to New Orleans Square. That’s where I have found them the most often, however I’ve seen them on Main Street, in Frontierland and more. They get around I tell you. Next time you are in Disneyland, ensure you take the time to sit a spell with others who are enjoying these amazing singers. you won’t regret it. More Limited Time Magic coming the week of July 8th to 14th. Visit Disneyland and celebrate Matterhorn Bobsleds. Matterhorn Bobsleds were originally opened June 14th, 1959 in Fantasyland and has been a staple of visitors to Disneyland ever since. Inspired by the true Matterhorn in Switzerland, Walt Disney originally visited when filming “Third Man On The Mountain” Side Note, Submarine Voyage opened the same year. Included in the Celebrate Matterhorn Limited Time Magic Week will be mountain climbers ascending and descending the mountain. You’ll also enjoy from the within the ride some Tyrolean music. Don’t forget to actually enjoy the ride as well! Take time to ride Disneyland history. Take a high speed, thrilling ride through the icy slopes of the most famous Swiss mountain. Be careful though the lines can be some of the longest in the park for this iconic ride. Head over to Edelweiss Snacks for a delicious Matterhorn Macaroon. Edelweiss Snacks is where you head for Turkey Legs as well. I think when combining a Turkey Leg and a Matterhorn Macaroon, you have an amazing meal. Or well, perhaps 15 Macaroon’s is a meal in and of itself, I think so. As always, Disneyland brings out nostalgic memories for me, and I hope it does for you too. Take time when visiting Disneyland to truly look around and see all that has been created for us to enjoy. One of the reasons I love visiting is I am always discovering something new. I hope we can continue to learn new things about Disneyland together on our CouponingtoDisney journey. I promise to keep writing new and interesting tidbits. If you ever have a specific Disneyland Topic you’d like covered, please email me at the Contact Him link below and I’ll share all the wisdom I have with you. Disneyland recently increased their ticket prices. If you are planning on heading to Disneyland soon, be sure to visit the grocery stores in Southern California first. Many of the stores (Kroger, Albertsons, etc) have Disneyland passes for sale in the gift card section at the old prices! Montebello Mom contacted Disneyland about these ticket passes and here is what she learned: The Disneyland ticket representative said that although the prices increased at the park they do not ask the grocery stores to replace their current stock. They are available while supplies last and can be redeemed up until the expiration date on the card. The ticket holder will not have to pay the difference in price. This will save you up to $30 per ticket holder! A long time from now in a city not so far away we may all get to visit Star Wars Land at Disneyland. The Disney-verse has lit up more than a Death Star explosion with the news of a survey being addressed to Annual Pass Holder and Fanatics. This survey includes a number of references to a Star Wars Land and asks what the respondents think of this expansion idea. What do you think? Would you like a Star Wars Land at Disneyland?